Last month, Nissan's new car sales surpassed Holden's for the first time in Australian automotive history. It's also the second time in the past twelve months that Nissan has beaten Ford in a monthly new car sales tally. In fact, Nissan is selling more cars now than when it assembled them locally (between 1972 and 1992). In disturbing news for Australia's struggling car manufacturers, the top-three selling car brands in February were Japanese. Only two locally made cars, the Commodore and Cruze, made it into the top 10 - barely. Industry veterans are blaming the Australian dollar, which has been at record highs for two years. In December, one Australian dollar bought 80 Japanese Yen, but as the Japanese currency weakens, the value of one Australian dollar climbed to almost 95 Yen at the start of March. The artificially devalued Yen has enabled Australian importers of Japanese cars to offer abnormally sharp discounts. Honda Australia has even reverted to sourcing some cars from Japan (rather than Thailand) because of the price drop. Brand-new models of the Nissan Pulsar, Toyota Corolla and RAV4 have recently been released in Australia with the same - or in some cases even cheaper - prices than they started with in the 1990's, despite being much better equipped. The dramatic effect of rising currency on the Australian car manufacturing industry has renewed calls for the Reserve Bank to weaken the dollar - and quickly. The industry is at risk of being squeezed down the market ladder as European brands also move to make the most of favourable exchange rates. Last year a Mercedes Benz was the second-highest selling medium sedan after the Toyota Camry, ahead of the Mazda6 and Subaru Liberty. 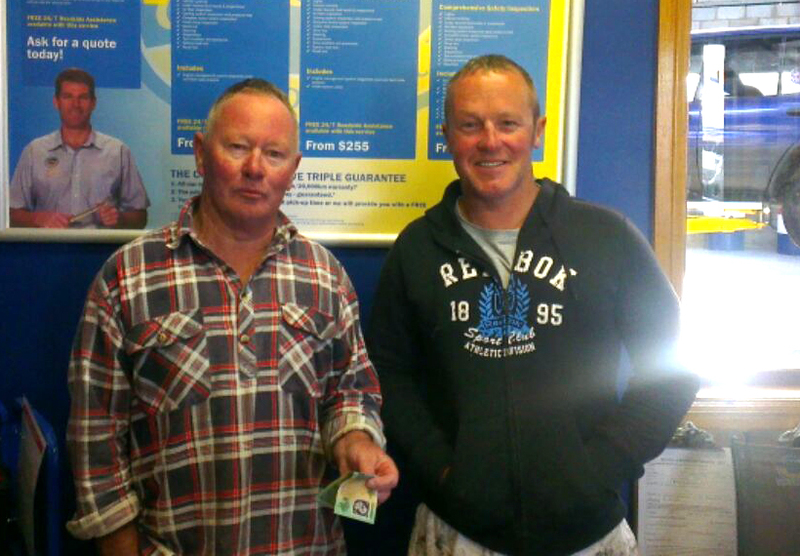 We’d like to congratulate Jason and Michael Conroy, who each won $100 from our Launceston Service Centre in February’s referral competition! How can you be sure that your service repairer is using quality parts when they service and repair your car? When it comes to your car's maintenance it’s very important, for both the longevity and value of your car, to use only quality brands and genuine parts - not cheap, generic products. Take engine oils, for example. There are a lot of companies selling engine oil, but to make sure your engine is getting the protection it deserves you're always better off sticking with the well known brands like Castrol or Valvoline. At Cooper Automotive we prefer Valvoline engine oil, and most of the time we use a specification that is better than the manufacturer recommends to make sure your car is getting the best protection possible. Another important example is your repairer's choice of brake pads. There are a whole heap of cheaper brake pads out there that some mechanics will put on your car - but we refuse to use them. The safety of you and your family is our first concern, so we only use Bendix brake pads which are the best quality brake pads on the market. Most people won't know too much about which brands are good or bad for their car. The best thing you can do to guarantee the quality of the parts in your car is to choose a service provider that you can trust and who guarantees their workmanship. If they are guaranteeing their workmanship you can bet they are using quality products. It goes without saying that at Cooper Automotive we only use the best quality parts and spares - becuse we care about your car!